Consumed by Books: I Won A Blog Award! Greetings, readers and followers! Jeremy of Novel Thoughts recently gave me a blog award. Thank you, Jeremy! "A prolific blogger is one who is intellectually productive, keeping up an active blog with enjoyable content. After accepting this award, recipients are asked to pass it forward to seven other deserving blogs." In the spirit of passing the award on and telling you about some of the blogs I love, here's to whom I would like to pass on the award. If you haven't already, be sure to stop by these awesome blogs and check them out. Happy Friday! Congrats on your award! :) And, now I'm checking out the ones you listed, too! Congrats on your well deserved award. Have a great weekend! Thanks for the award! 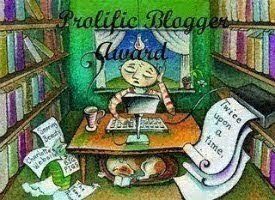 You are definitely a prolific blogger yourself! Congrats on your award! Thank you for passing it on to Reading Vacation. That was very sweet of you.